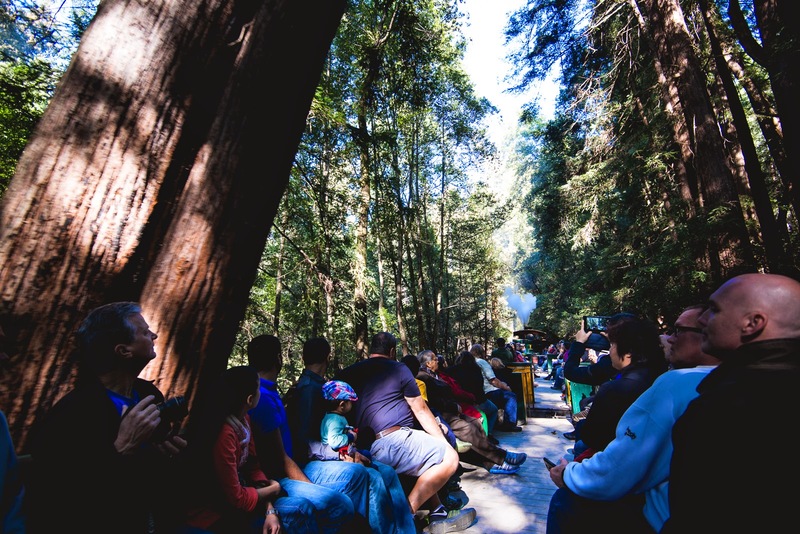 I just read THIS great article that the National Parks Service saw a record number of visitors in 2014 at 292.8 million!!! If you we were not one of the those 292 million people, then make 2015 the year you go! 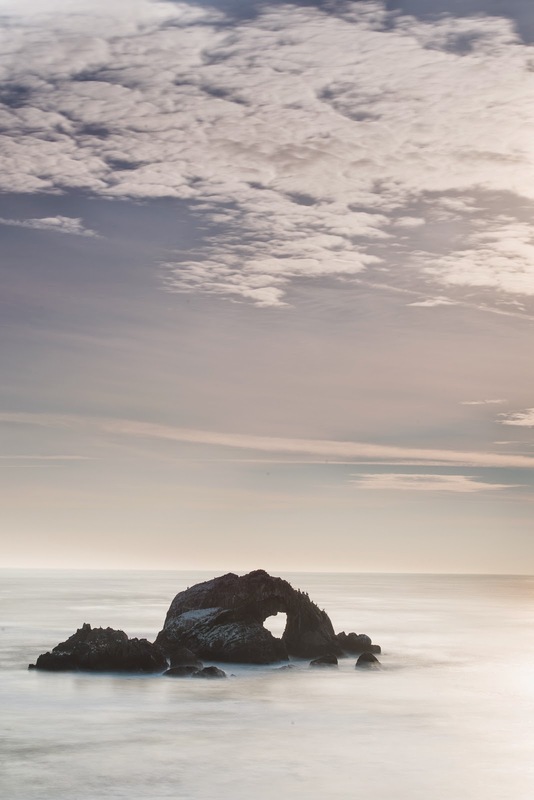 You have no idea what you are missing by not taking advantage of all these amazing places so close to home. 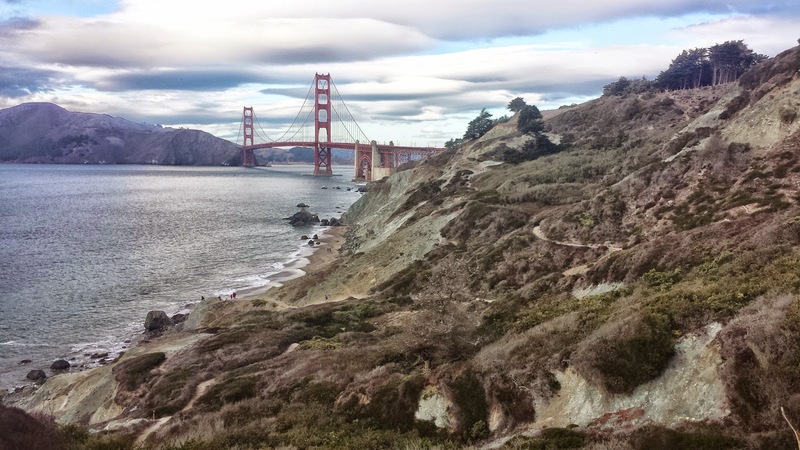 The Golden Gate Recreational Area topped the list of Most Visits with 15 million visitors. Being such a vast area and having been to many of the places within it, I wonder how this count is actually tallied. If I visit 6 places within the area in a month, am I counted 6 times? 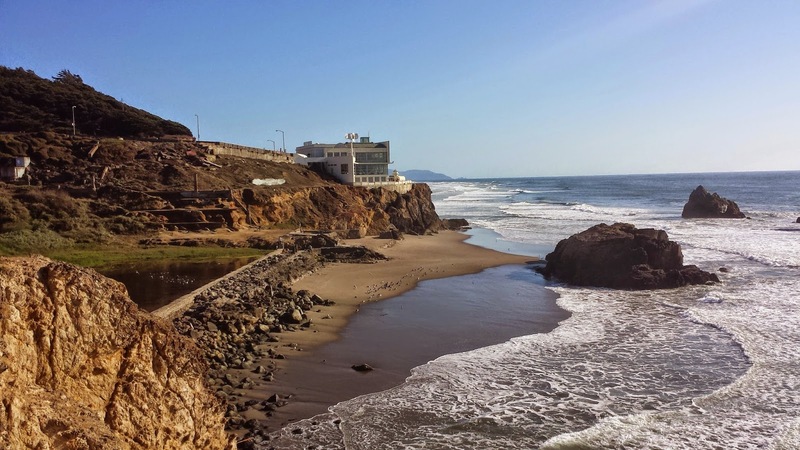 Regardless, it really is a great area and anyone who lives in San Francisco is very fortunate to have this scenic playground right outside their backdoor. 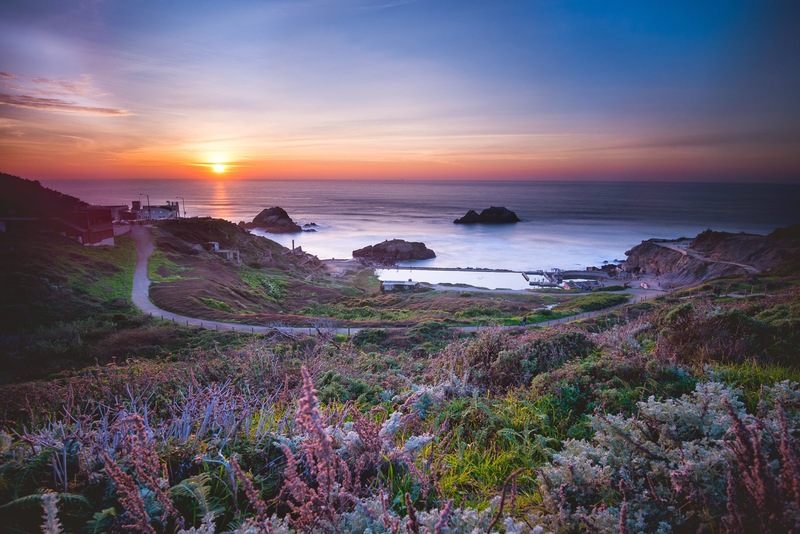 The area includes many of our favorite and shared places such as the Marin Headlands, Land's End, and Muir Beach. Many more of the places I will share in the future as well. The most visited National Park was right in our backyard just a few short months ago, The Great Smoky Mountain National Park. Now, I have to admit, I used to be a real snob when it came to travel. I thought the only trip worth taking was a trip out of the United States. I thought that visiting places within the US was for old people who just didn't have the energy to tour other places, but oh how wrong I was. 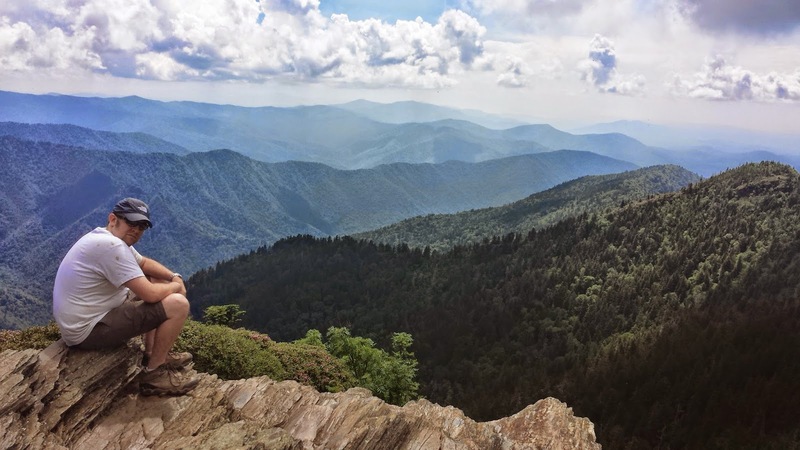 I've walked for 12 hours a day in Rome, taken hikes in the Alps of Switzerland, and SCUBA dived in Belize, but the most physically demanding adventure of all my travels was the hike Adam and I took in the Smoky Mountains last year. Although I never got around to blogging about it, Adam and I spent our fifth wedding anniversary last June in the Smoky's. It was my first visit and so much more than I could have imagined. We spent a long weekend, hiking and taking pictures, camping and relaxing in a super nice hotel. It wasn't just a rough and tough, always dirty trip, but a great combination of a little bit of everything all rolled into one.. I never would have thought, I could have had such a wonderful trip so close to home. Although our trip to the smoky's was adults only, National Parks are a great place for kids too. I was talking to co-worker last week about going to Yosemite and despite living here his entire life, he has never been. I couldn't believe it! 30 years and less than a 4 hour drive and he's never made at least one trip to one of the most iconic national parks in the US. I tried to convince him to change that, but he just shrugged and said his 2 year old son would be bored. Are you kidding? 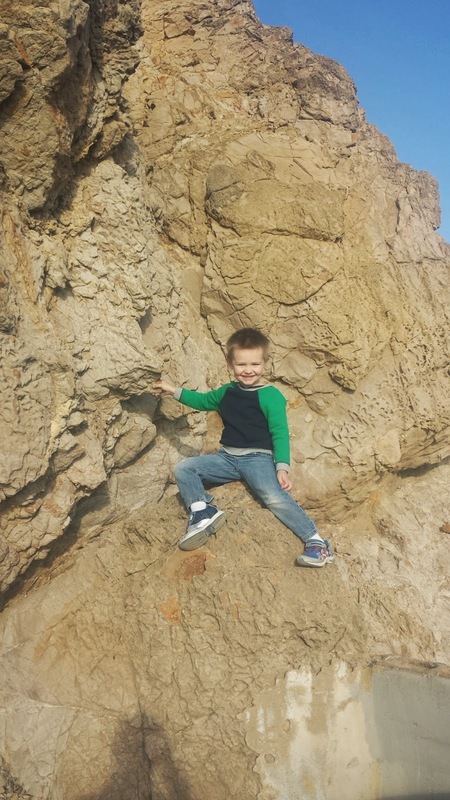 What does any 2 year old boy want to do? Run around. Play in dirt and rocks. Climb. Explore. HELLO! A national park is any kids dreamland. Why do we as parents constantly think we have to entertain our kids with toys and gadgets? Why not let your kid explore, discover, and play on their own using their own imagination? 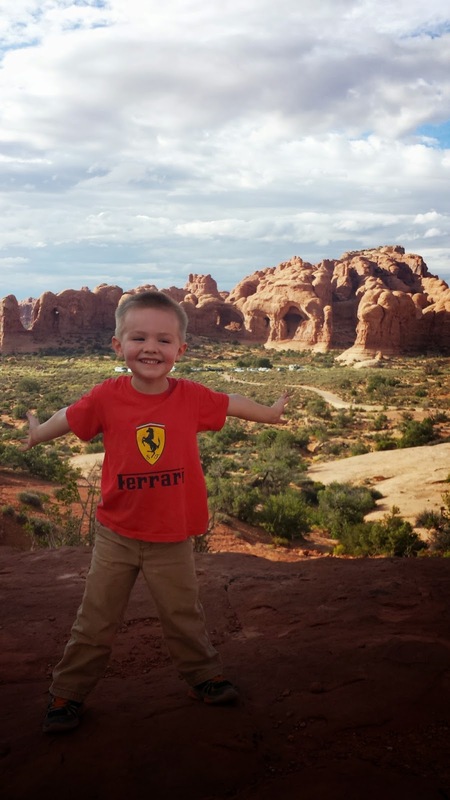 The key for any kid to enjoy a visit to a National Park, is to make it fun for them. Help them use their imagination and create a story around the setting. 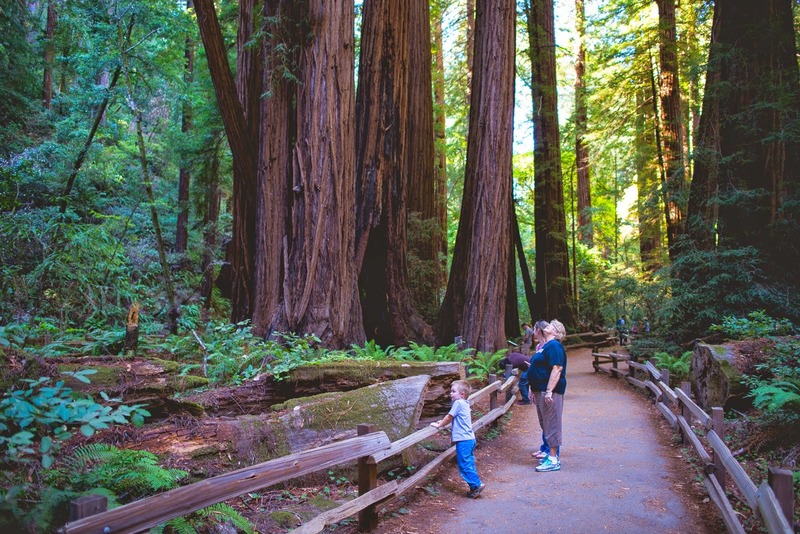 For example, my brilliant Mother-in-law told Landon to be quiet at Muir Woods so he could hear the trees talking. It worked wonders, because not only was he quiet (they have quiet zones within the park), but he enjoyed the entire experience so much more. Now every time we visit, he tells us to be quite and listen to the trees. He comes up with stories about what they are saying. He's more interactive in the experience, he behaves better and we all end up enjoying it more. Thanks Lynn! Last year, we visited five national parks- The Great Smoky Mountains, Arches, The Grand Canyon, Yosemite, and Pinnacles. As well as a number of national monuments. We plan to visit at least seven more this year. Our new home is a great springboard to explore so many parks and service areas, but now that we've had a taste of these wonderful places, we have an insatiable thirst to visit them all. 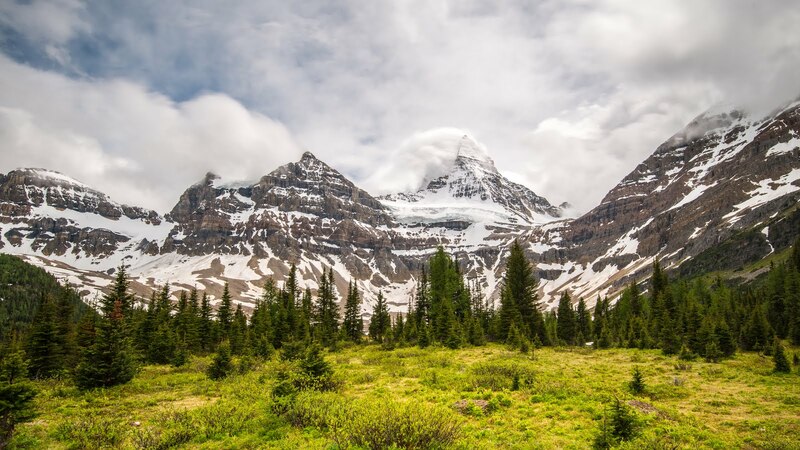 Visiting national parks is just as addicting as any other kind of travel. I always tell people who haven't been abroad, just go once. Your only regret will be that you didn't do it sooner. The same thing applies here. The US has more to offer than I ever realized and if you are not enjoying it, you are simply missing out. So that is my PSA on national parks and why EVERYONE needs to go, not someday, but now! 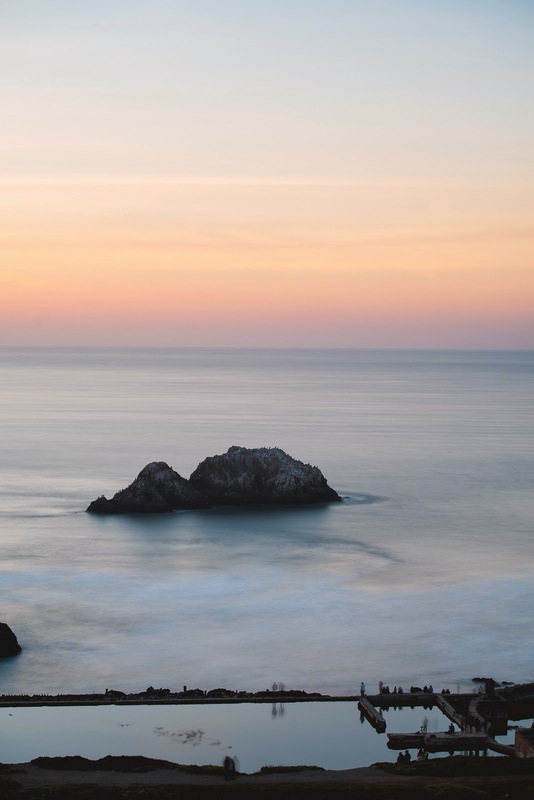 As cliche as the saying goes, there are seven days in a week and someday isn't one of them. No matter where you live, if you have the ability to read this post, you have the ability to visit at least national park or monument in 2015. 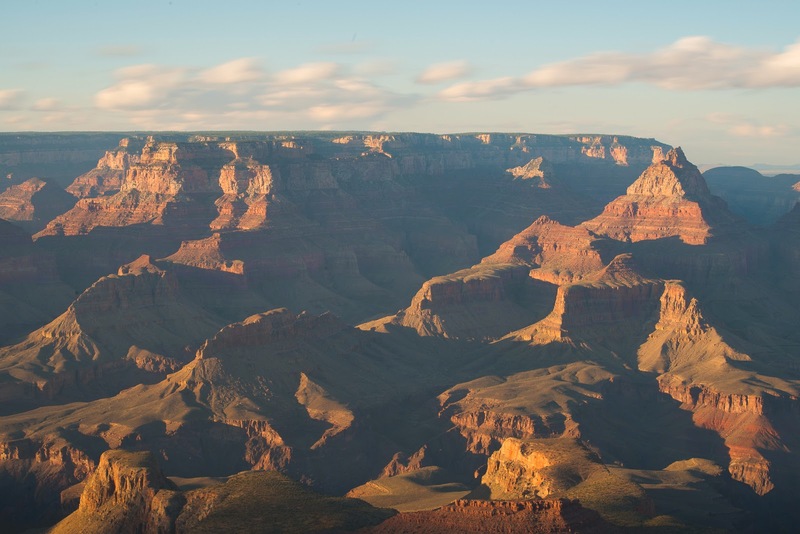 HERE is a list of the national parks and monuments by each state, every state has something and you'd be surprised how many are closer than you know. Now is the time, go explore! This weekend we decided to take advantage of the record-breaking temperatures with a day trip to Yosemite. The only problem? So did the rest of Northern California.... In the five times that we've been out to Yosemite, we have never seen crowds anywhere near what we saw last weekend. I'm not saying it never happens, but it certainly was new to us. We woke up and got what we thought was an early start. We had left the house by 9am, which, for us on a Saturday morning, was pretty good. We didn't take my favorite route to the park, but we were treated with a nice surprise along our drive...the cherry trees are beginning to bloom! It wont be long until they are at full bloom and soon after the SFO airport will be swamped with exporters shipping out cherries all over the world. For now, it made an otherwise boring drive a little more enjoyable. A little after 12:30 we pulled into the line of traffic waiting to get into the park (our first indication of the madness to come as we have never had traffic at the gates). Upon, entering the park, we made the 25 mile (or so) journey to the valley and headed for our first hike of the day, Lower Yosemite Falls. On the way down we came across a beautiful waterfalls and pulled over for a few minutes to enjoy it. The main reason we decided to visit Yosemite this weekend was because a large storm came through the park last week dumping a lot of water and all the falls were going strong, It was something we had yet to see and coming across the first waterfall only increased that excitement. Call us naive, but before we witnessed the masses, it didn't even occur to us everyone else would be there as well. For one, I figured on Valentine"s Day, people would be going out to fancy dinners and not spending the day getting sweaty at a park. Neither of us were off on Monday so we didn't consider people might be traveling more over their long weekend. We are season pass holders, so the free days don't appeal to us. Yes, we came to see the falls too, but we live in an area where the weather is nice year round so we were not looking for an excuse to get out of the house. We didn't even consider people living the same three hour distance in a different direction are dealing with lots of snow and freezing temperatures this time of year. As we drove and drove, looking a place to park, all of our spirits started to fall a bit. All we wanted to do was go out and explore and I could tell our well laid out plans for the day were going to have to be drastically altered. In Landon's words, (one of his favorite phrases too!) "This is taking FOR-E-V-E-R!" and it was. Just as were all about to give up, we finally found a parking spot and our spirits jumped right back up. We hopped out of the car as quickly as we could and made a beeline for...the bathrooms. haha! Five hours in a car will do that to you. After our detour, we headed to in the direction of Yosemite Falls. Originally, we had planned to hike Lower Falls first, grab some lunch, then spend our afternoon on the more strenuous Upper Falls hike. We knew when we got out of the car that we wouldn't have time to do both so we opted to do the easy one mile hike to Lower Yosemite Falls and see if we could manage to squeeze in something else afterwards. The hike to Lower Yosemite Falls is flat and easy. There is a large path that leads directly there and I think it is even considered wheelchair accessible. The easiness of the hike means everyone goes. I mean, everyone. I couldn't believe the number of people at the base of the waterfall once we got there. People were everywhere, tour groups with matching shirts, families hollering at each other, and everyone taking pictures of themselves at the falls. As much as I was disappointed to have so many other people around, making all kinds of noise, and distracting from the setting, it was hard to over power the waterfalls. This 400ft lower drop of Yosemite Falls was simply breathtaking. I couldn't believe how powerful it was seeing as it has always been dry in our previous visits. 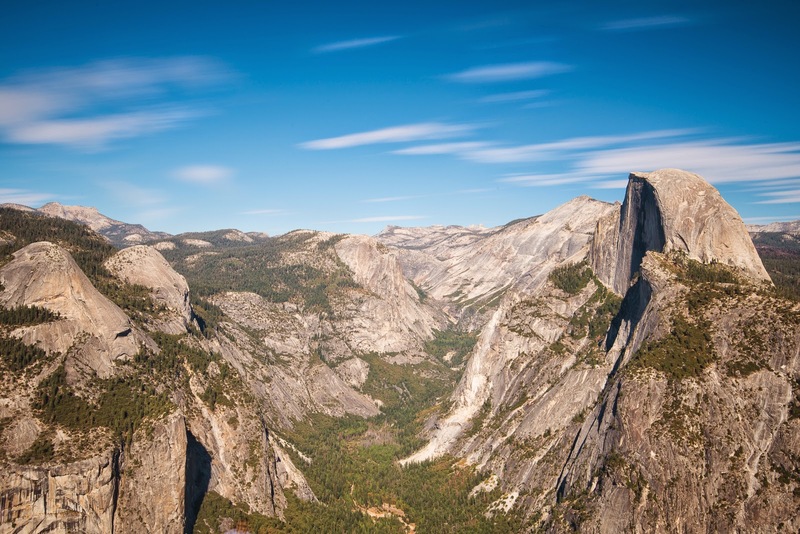 There is no doubt that the defining feature of Yosemite is the granite rocks that have made this park famous. Yosemite Falls is the perfect compliment of the rocks. Showcasing their texture and highlighting their vastness. As you sit at the edge of the creek, the waterfall sends over a cool mist. Some people ventured over to the pool at the base of the falls, but we were content just enjoying the view from a little ways back. Unfortunately, you cannot see the entire falls from this point. Upper Yosemite Falls, does however come into view the further away from the falls you get. As you hike back on the other end of the trail, you spend more time looking back than you do walking forward. Perfectly framed by the trees, this view is quite stunning and I couldn't help but wish we had the area all to ourselves so we could sit in the middle of the path and soak it all in. I had to keep dreaming though and focus on the scenery not the crowds around us. We walked over to the cafe and grabbed a sandwich (by now it was after 4pm) as we plotted what we could possibly do next. On our walk, we continued to get full shot views of the waterfalls. We grabbed a quick bite and decided to head over to try and catch the sunset on half dome. This meant getting back into our car and, while traffic wasn't as bad in the direction we were headed, we pretty much watched the sunset from our car. As we got out and walked into the field, the sun had just left the rock face. What we saw was stunning, but our setting wasn't what we were hoping for. So, we hoped back into the car and decided we'd start making our way Tunnel View so Adam could take some nighttime pictures. And we didn't have to figure out how to waste time waiting for the stars to come out, because we sat in traffic for well over an hour just trying to make it to the other side of the valley. By the time we finally arrived at Tunnel view, Landon was asleep in the car and I had a new problem, I wasn't feeling very well. Adam got out and spent some time taking pictures. We've never lived anywhere with such a dark sky. From the car, I could look out and automatically see the Milky Way. As your eyes adjust, the millions of stars turn into billions. I cannot describe how breathtaking of a sight it is. 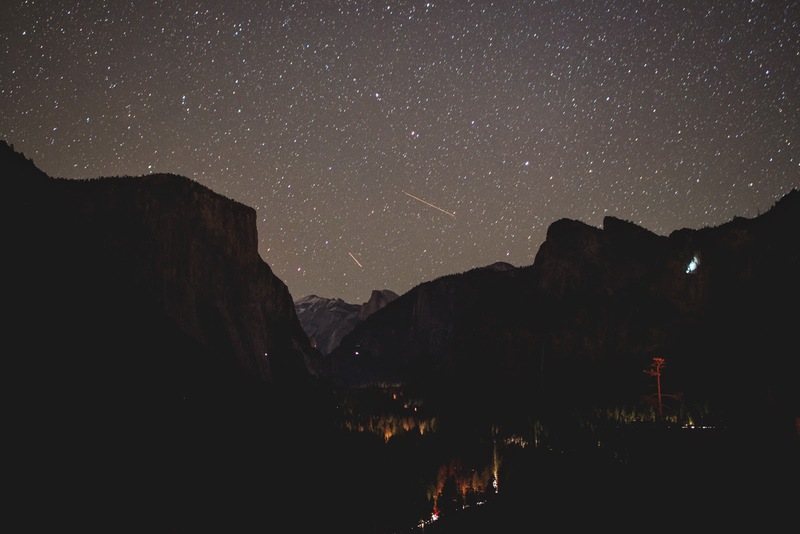 From the picture below, you can tell that even at night, people find ways to enjoy Yosemite. That dot of light on the cliff face of El Capitain are people by the way. In the full size picture, you can even see a dot of light on the top of Half Dome, more people must be camping out on top having climbed up with the cables down. Adam spent some time practicing astrophotograhpy, something that is impossible not to become more interested in out here. 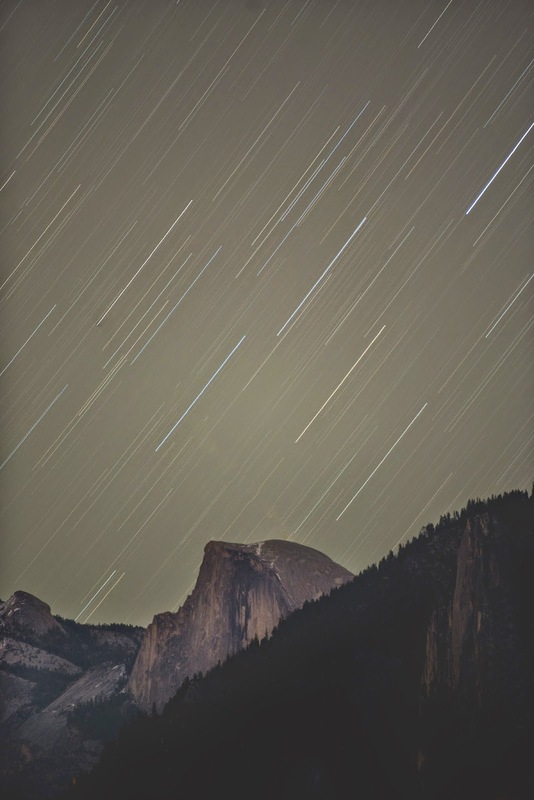 This is an 8 minute exposure of star trails over half dome (stars moving within the night sky). Happy with what we got and wanting to learn more, he got back in the car and we started the long drive home. I spent all day Sunday sick, only for Adam to get sick Sunday night and spend all day Monday sick. Between the crowds, time wasted in traffic, and ending the day falling under the weather, it wasn't the day we had planned for. That being said, it was still an awesome day. Any day is in Yosemite. It's beautiful and worthwhile. I'm so glad that we got to see the waterfalls gushing which alone was worth the 12 plus hours we spent in the car. We did learn a few lessons though, things we are going to apply when visiting Yosemite from now on in an effort to always get the most of our trips there. I have a feeling, in the past, we've been fortunate to avoid the crowds, but the crowds are probably more common than not especially during the Spring and Summer. Since we already have an annual parks pass, from now on we are going to try and avoid the free days. With only a handful a year, it should be pretty easy to find something else to do those times. We've decided moving forward we need to beat the crowds. That way, by the time the rush of people are bearing down, we can be a few miles into a nice, peaceful walk, oblivious to the insanity on the roads. Our main way of doing this is going to be to come into the park, or nearby areas the night before. Mainly. we will leave after work on Friday and camp (usually) or rent a hotel somewhere nearby. 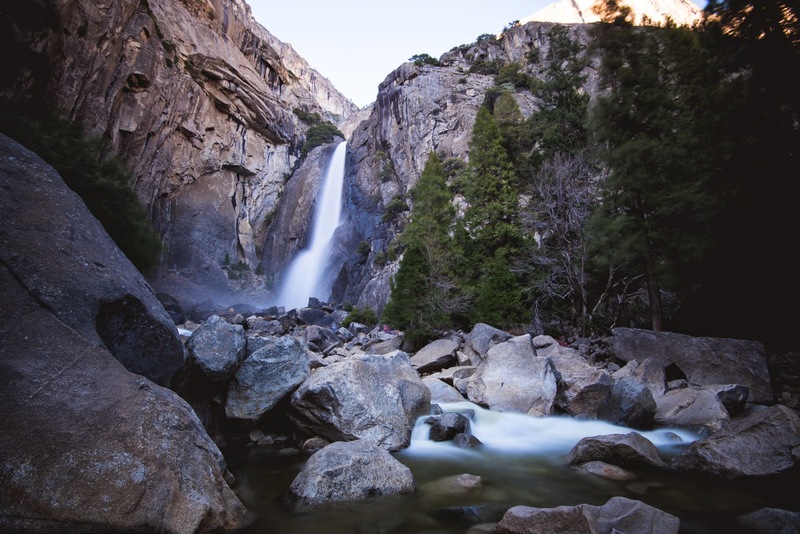 Although, the camp spots in Yosemite fill up quickly, the entire area surrounding Yosemite is the park of Stanislaus National Forest and there are a ton of places to camp and stay nearby. That being said, we are also going to start booking this years upcoming camping trips now. We have a lot of weekend trips planned as well as one trip home to Louisville and another to Oregon this year. We found some great people in our complex to help us with Kaiser so now we feel like we can really get out and explore our area beyond a few day trips. Not having much vacation time this year, we plan to maximize long holiday weekends and pack other outings into our regular two days weekends. I'm looking forward to the end of busy season so we can start getting out more. It's time to start planning! Yosemite, is one of our favorite places (do I say that a lot?) in California and we have a few camping trips planned there this year, but I also think the shoulder seasons might be our most enjoyable times in the park. Not only that, but there are so many places around and beyond the park we cannot wait to explore and are due some of our time. There's no doubt, we will be visiting Yosemite again, I think Adam already mentioned going back this weekend (ain't going to happen), but from now on we will be smarter about it. I don't know if it was the perfect storm or if this is a glimpse of things to come, but at least when we do go back we will be more prepared. It was still a wonderful, well spent day with my favorite boys and a great way to enjoy Valentine's Day. As a note, when we took this picture, Landon asked why he couldn't be in too. We told him, it was the blue coat club picture and he agreed, his coat was red and he liked it better anyway so it was ok.
A few weeks ago, Landon turned 4 in the most anticipated birthday EVER! He's been talking about turning 4 for awhile now. All he wants in life is to be big. He kept asking if when he turned 4, would he "be big". His favorite line is "One day...when I am big like my Daddy...". Hes got it so good, but if he had it his way, he'd be a big person tomorrow. Poor thing has no idea what he is asking for. My Mom and her boyfriend came in to visit and celebrate his birthday with us which turned out to be really nice, because Adam was out of town for work. On his birthday, we kept it simple and saved the big celebration for the weekend. The day he turned 4, he got to stay home with Grandma and Jack and play all day. They spent a lot of time at Golden Gate Park where he rode around on his bike and explored the park. When I got off work, we went to dinner and then came home for some presents and cake. I think we entered gift overload as he was too excited about the next gift in front of him to even pay attention to the gift he had just opened. Once they were all opened it was a different story and he loved playing with everything. He was so into his gifts, he didn't take more than a bite of his cake. Landon has the best family and he received all kinds of great gifts. He was pretty excited about his first pair of boxers from his Nana. His dinosaur mat and collection from his Aunt Mary and Uncle Sergio. A Passports monthly subscription from his Uncle Matt and Aunt Marty. My favorite was one of the many gifts from his Papa and Nana Cathy, a Leap Frog Write and Scribble that helps teach him to write out his letters and numbers. He absolutely loves it and just in the last week he has made a big improvement on his writing. His most useful gift came from his grandma in the form of a much needed wetsuit. Which he immediately put on (along with his new hat) and continued to wear for two days. After his first birthday, I decided not to have birthday parties for him, but to take him out on (or around) his birthday for a fun day of activities all geared towards him. It isn't usually something we do, so it is extra special for him to have a day doing things he wants. I try to think of some fun things I think he would like and then we let him pick what he wants to do the most. This year, his first pick was a ski lesson at a nearby ski resort, but the weather around Tahoe hasn't been the greatest so we put that on the back burner for a little later and he decided on a train ride instead. 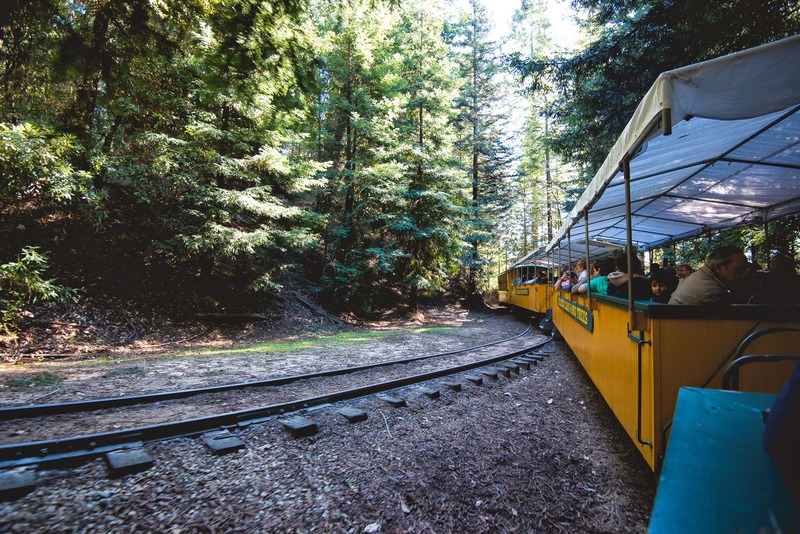 There are a few companies in the surrounding areas that offer train rides in a variety of settings, but after a little research and talking to other people we decided to head over to Santa Cruz and go on the Roaring Camp Railroad Steam Train through the Redwoods. 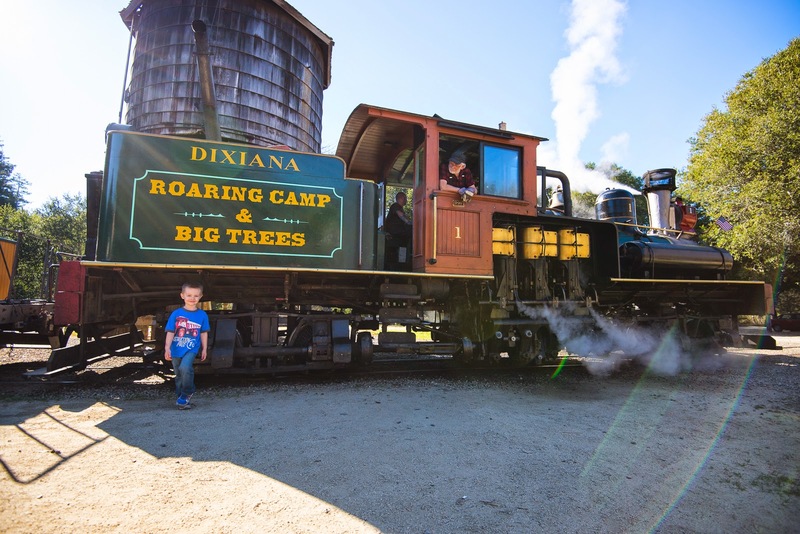 We picked this train ride for a number of reasons, the main one being the steam engine. I thought it would really be a delight for all of us and it was! We made it in time for the once-daily (winter schedule) ride just by the skin of our teeth. We really lucked out though getting our seats at the end of the third open cart. I think we had the perfect seats as we were not too close to the very loud engine and we didn't get stuck in the back three carts which all had a canopy over them. 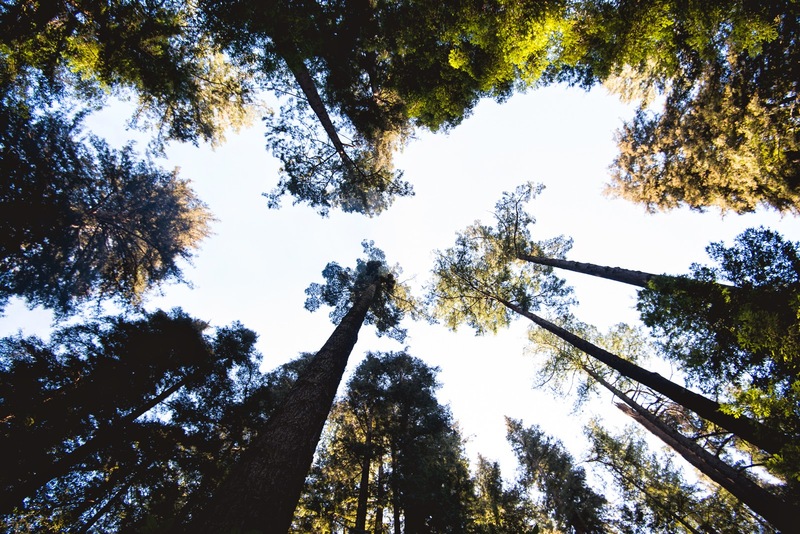 I would not have wanted anything overhead as we spent most of the time gazing up and out as the giant trees soared above us. Although there were a number of children, there were also a number of adults without kids and I don't think they felt that this was geared towards children at all. The train was amazing to see especially in action. A few times it even put on a little show blowing it's steam and making music. About 30 minutes into the ride, we reached the peak of our trek, Bear Mountain. At this time, they let everyone off to explore the area for about 15 minutes. My Mom and Jack went over to hear them talk more about the redwoods and the history of the area, while we studied the engine up close. Adam was especially enamored with the craftsmanship and mechanics of the engine which dates back to the 1890's. We should have asked if Landon could get up inside, because once one family asked and the conductor was happy to oblige and a line quickly formed. Landon was a little scared of getting too close to the big engine and was especially worried the steam would burn him, but he loved it none the less. After the break, everyone got back onto the train and we went back down the way we came. I would have enjoyed a longer train ride, but the 1.15 hour ride was perfect for Landon and his short attention span. It was just long enough for kids to enjoy it and stay captivated with the experience. I don't recall a single child being antsy despite everyone remaining seated during the ride. When we arrived back at the station, we treated ourselves to some ice cream and enjoyed the setting a bit. The entire place is made up as an old western town which really makes the entire experience feel more authentic. Given that we visited in the winter (or off season), a lot of the stores and activities, such as gold panning, were not open. We could tell in the summer the place hosts big crowds and has a lot going on, but we didn't feel like we had missed out at all. The train was full so any more people would have just meant longer lines for ice cream. More events would have just been more ways to spend money and since the train ride alone cost the three of us about $75, we felt like we had spent enough. Although, it seemed a little pricey, it was well worth the cost and something we all enjoyed. It isn't something we will do often, but they do have a Easter Egg Hunt and since we lack family to spend our Easter with or space for egg hunts at our house, it might just be the perfect way to spend Easter. After our yummy snacks, we decided to head to Landon's favorite place to finish out his big day...the beach. Only 20 minutes away from the train, we headed in the direction of the water and ended up on the Santa Cruz pier. It's the first pier I've been on that also functions as a parking lot, but it worked out great. We even got our first glimpse of one of our summer stops, the boardwalk. We unloaded Landon's bike and let him ride it all the way down to the beach. We packed a picnic and so while Landon had the time of his life, we enjoyed some yummy food with a great view. Afterwards, Landon and his Daddy worked on building a sandcastle. Even my Mom couldn't help but join in on some beach fun and threw the football around with us for a bit. I don't think I've seen my Mom throw a football. Unfortunately, it wasn't long before the sun was setting and the temperatures started to drop. We ended the day with a beautiful beach sunset. Once it was cold, we packed it all up and Landon rode his bike back up the pier to the car. That is about as good as it gets in his little world. And if there is any question if this guy had a good birthday weekend, Sunday night, about an hour after he went to bed, Adam and I heard a thump. We didn't know what it was at the time, but a little later Adam happened to go into Landon's room to find this. Out, stone cold, even the fall didn't wake him up. It sure is hard being four!